Markus Babbel has been sacked as Stuttgart coach after a poor run of results this season. 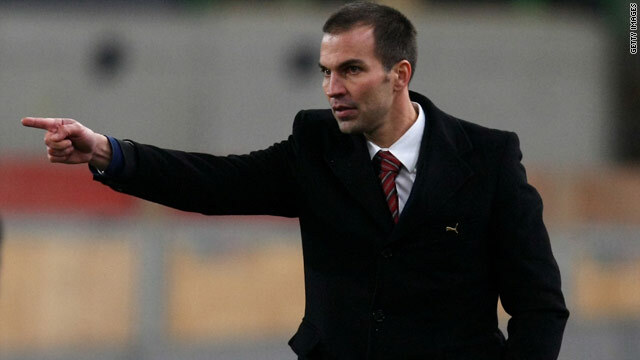 (CNN) -- Stuttgart have appointed Swiss Christian Gross as their new coach after dismissing Markus Babbel on Sunday. Babbel and his coaching team were relieved of their duties 24 hours after Saturday's 1-1 draw at home to Bochum, which left the club languishing in the bottom three of the Bundesliga. Gross, who has been out of work since leaving Basel in the summer, was presented as the club's new coach only hours after Babbel had left the club's training ground, said his goodbyes to the players and given his successor his full backing. Babbel said at a press conference: "We had reached the point where personal destiny was no longer important. "All that matters is VfB Stuttgart. Everything has to be done for them and this is the measure which has been taken. "I wish the new coaching team all the best. I hope they can find the right button and press it so that the team works again. I could not find it." Babbel lasted just over one year in charge of the 2007 Bundesliga champions, leading them from mid-table, where he found them upon replacing Armin Veh, into the Champions League by virtue of their third-placed finish following their best ever second half to a season. However, he struggled to juggle his statutory attendance at a coaches' training course with the full-time demands of managing a Bundesliga side and the draw with Bochum proved to be the final straw for the club's board. "It is now the turn of 55-year-old Gross to try and master the situation, starting with Wednesday's decisive Champions League tie with Unirea Urziceni at the Mercedes-Benz Arena. Stuttgart need to beat the Romanians to reach the last 16 of the competition. Meanwhile, in Sunday's two Bundesliga matches, Schalke moved up to third position in the table thanks to a 2-0 victory over struggling Hertha Berlin. Kevin Kuranyi's 100th Bundesliga goal put the Royal Blues in front on the hour mark and a stoppage-time penalty from Rafinha sealed the win. Berlin put up a brave fight as they went down to their 12th defeat of the season with Adrian Ramos missing a glorious opportunity to earn them a draw, but it was not their night as they also lost Christoph Janker to a late red card. The defeat means Hertha Berlin will certainly end 2009 at the foot of the table since they trail 17th-placed Nuremberg by seven points with just two games remaining. In the other match, Cologne slowed down Werder Bremen's high-octane attacking play to earn a valuable point with a 0-0 draw in their fight against relegation -- while Bremen missed a chance to close the gap at the top of the table. Cologne had the better of the chances despite having the worst goal-scoring record in the league. Second-placed Werder came into the game with 12 goals in their last three contests but could only draw to move onto 28 points -- three points behind leaders Bayer Leverkusen.